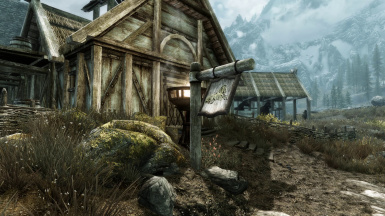 Skyrim is a windy region, yet hanging lanterns and signs outside stores and inns are unaffected by the strong winds. This subtle immersion mod enables signs and lanterns to react to wind like they logically should. sialivi - Author of this mod. Hanaisse - Nifskope and Blender assistance. Acid Zebra - Author of Balthazars Books - a Markarth bookstore. AlexanderJVelicky - Author of Falskaar. anamorfus - Author of Enhanced Lights and FX. Arthmoor - Author of Shor's Stone and Open Cities Skyrim. Autan Waspeez - Author of Signs of Skyrim. Boric123 - Author of Aevon-Tor Reloaded. bjs_336 - Author of Skyrim Bridges. BluePianoTwo - Author of Dawn of Skyrim (Director's Cut) and Dawn of Skyrim (Original Collection). Brumbek - Author of Static Mesh Improvement Mod (SMIM). CovertKish - Author of SkyFix - Tidier Warmaidens Workshop HD. css0101 - Author of Nordic Lantern. Darkfox127 - Author of Merchants of Skyrim. Elianora - Author of Skaal You Need - Skaal House and Follower. EvilDeadAsh34 - Author of Mystical Illumination: Glowing Signs. Flaho Shi and Kojak747 - Authors of Legend of the Eagle's Nest modified for Ebonvale. InsanitySorrow - Author of Insanity's Lanterns. Jokerine - Author of The Bloody Tankard, Cake O'Clock, The Honey Spirit, The Golden Rose, Restored Stumbling Sabrecat Inn and Frostfield - Loreius Farm Settlement. JKrojmal - Author of JK's Cities LITE and SuperLITE, JK's Dawnstar, JK's Dragonbridge, JK's Falkreath, JK's Ivarstead, JK's Morthal, JK's Riften, JK's Riverwood, JK's Rorikstead, JK's Skaal Village, JK's Skyrim, JK's Skyrim Major Cities Only, JK's Solitude, JK's Whiterun and JK's Winterhold. MannyGT - Author of Books of Skyrim, Lanterns of Skyrim - All In One and Rounded Lanterns. Mena - Author of Inns and Taverns. Mike Hancho - Author of Helgen Reborn. mikraemer - Author of Lanterns of Skyrim - Skyrim Bridges Patch. missjennabee - Author of Expanded Towns and Cities. MyGoodEye - Author of CLARALUX - More and Brighter Lights. NevahNevah - Author of The Haven From The Cold And Dark. Nimbli Bimbli - Author of Weathered Road Signs. Otellino - Author of Nordic Carriage Company. Phitt and Tamira - Authors of Phitt's Morrowind Style Lanterns. Prometheus - Author of No snow under the roof. Shezrie - Author of Shezrie's Old Hroldan Town. SureAI - Author of Enderal. Urtho - Author of Settlements Expanded. yourenotsupposedtobeinhere - Author of Highland Milk Farm. Enabling all signs to react to the wind. Enabling all hanging lanterns in exterior locations to react to the wind. The mass of the signs have been increased so they don't swing quite as violently as the vanilla signs. The min/max angle of the hinges have been increased to prevent the signs from slamming against this artificial limit. The havok material of all wooden signs have been changed from metal to wood. Using the signs for target practice is much more satisfying when the arrows get stuck in the signs rather than get deflected. Corrected the havok material of a few wooden beams that signs hang from. They were incorrectly set to metal. Should be compatible with mods that replace the textures of the signs. Compatible with weather mods, though if they alter the wind strength this will change how much the signs and lanterns swing. Mods that adds new signs that doesn't use the vanilla sign meshes won't conflict but those signs will be unaffected by the wind until I make a patch. Request support in the comments section and I'll take a look at it. Not compatible with mods that replaces the vanilla sign meshes. Request support in the comments section and I'll take a look at it. Mods that replace the vanilla lantern meshes won't conflict since this mod uses unique filenames and records. Mods that add new lanterns to the world won't conflict, but will also not benefit from this mods movable lanterns until I make a patch. Request support in the comments section and I might take a look at it. ¹ Patch converted to Skyrim Special Edition. ² Doesn't need to be converted to Skyrim Special Edition since it's only meshes. ³ Only signs are supported, hanging lantern support will be added later. The mod can be installed at any time and comes with FOMOD and BAIN installers to help guiding you through the installation. The installers will detect which mods you have installed and pre-select the right compatibility patches. The mod doesn't use any scripts and can therefore be uninstalled at any time. Place "Blowing in the Wind.esp" as high in the load order as possible, before any mods that alters signs and lanterns. Place each compatibility patch right after the mod it patches. Q: Does the mod use any scripts? Q: Why does it need .esp files? I thought the mod only altered the meshes? A: Just replacing the non-moving meshes with moving ones is not enough, the records need to be changed from static to movable static as well. In addition to that, the same mesh and the same records are used for both hanging lanterns and lanterns placed on surfaces. I have therefore had to manually audit every single lantern to see which ones are hanging and replace only those with the new movable versions. Q: Can I merge the .esp's? A: I don't see why not. I have no experience with merging mods though, so I can not provide any help or assistance. Q: Why are the signs and lanterns not blowing in the same direction as the columns of smoke from braziers, chimneys and campfires? A: The smoke columns are simple animations that are not physics/wind enabled. Rotating the columns to match wind direction would require scripting, but I might consider doing this in the future. Q: Why haven't interior lanterns been replaced with the same movable lantern meshes? A: Lanterns in interior locations could certainly benefit from also being movable when something collides with them. I am however still quite busy with the exterior lanterns that are affected by wind, which is obviously higher priority. Q: Why are the signs and lanterns not blowing in the same direction as the falling snow? A: I'm not sure the snowfall takes either wind direction or wind strength into account at all. Correct me if I'm wrong. This mod is the work of sialivi. Brumbek who gave me permission to include his SMIM signs and lantern meshes. Hanaisse for her Nifskope and Blender assistance. MannyGT who gave me permission to include his Rounded Lanterns mesh. css0101 for the Nordic Lantern resource. anamorfus - Author of Enhanced Lights and FX (ELFX). Arthmoor - Author of Open Cities Skyrim and Shor's Stone. Jokerine - Author of Bloody Tankard, The, Cake O'Clock, Frostfield - Loreius Farm Settlement, Golden Rose, The, Honey Spirit, The and Restored Stumbling Sabrecat Inn. Ld50365 - Author of Castle Valdmire. NevahNevah - Author of Haven From The Cold And Dark, The. Shezrie - Author of Old Hroldan Town. The Realistic Lighting Team - Authors of Realistic Lighting Overhaul. jonwd7 - Author of NifSkope. The xEdit Team - Authors of TES5Edit and SSEEdit. ousnius - Author of SSE NIF Optimizer.